Silage is often the base forage for the diets of growing cattle and the cow herd. This past year, due to the drought, thousands of acres of drought-stricken corn and sorghum were harvested as silage. A hidden cost of silage is associated with the shrink due to fermentation, storage, and feedout. Total shrink from harvest through feeding can result in the loss of 5 to 40% of the dry matter harvested. This is generally a hidden cost on most operations due to the lack of accurate records to measure shrink. However, a few basic principles can help reduce losses. The first is the correct harvest moisture. Plant material should be 32-35% dry matter at harvest. Lower dry matter content often results in fermentation by clostridia bacteria and an increased amount of seepage from the silage mass. This condition results in increased amounts of butyric acid, increased ammonia, increased pH, and the potential for decreased intake by ruminants. Silage with more than 38% dry matter generally results in greater losses during fermentation and a greater potential for increased losses from the silage face during feedout. Most of these losses are associated with the poor packing and the increased amount of oxygen that must be eliminated during the fermentation process and the increase in oxygen infiltration into the exposed face of the silo during feedout. This results in increased secondary fermentation by yeast and mold, resulting in increased losses of energy and other nutrients by the heating of the silage. Once harvested at the correct moisture, producers should concentrate on quickly packing and covering the silage mass. We will never eliminate the loss of dry matter and energy due to residual plant respiration and the fermentation process. The silage will have an initial increase in temperature due to these factors. However, these can be minimized by reducing the oxygen level to a minimum with effective packing and applying an oxygen barrier and a plastic cover immediately after finishing the packing. Generally, it is advisable to fill the silo in one day or less to avoid surface losses. If effectively packed to reach a density of at least 45 pounds/ft3 (on an as fed basis), most of the oxygen will be eliminated and heating minimized. There are available engineering equations that combine the silage delivery rate, hours of packing and the weight of the tractors to estimate the finished density of the silage mass. The goal is to apply per ton, a minimum of 600 pounds of weight per hour. This will also result in a silage face density that will be more impervious to oxygen infiltration during feeding. The two main silage acids, acetic and lactic, are volatile, meaning they will quickly disassociate to the atmosphere when exposed to oxygen. Thus, the pH of the exposed silage mass increases allowing yeast and mold to grow which results in increased secondary fermentation loss. Total losses of dry matter during the feeding phase can reach 25%. However, if one feeds at least 6 inches off the silo face each day, this type of loss can be nearly eliminated. 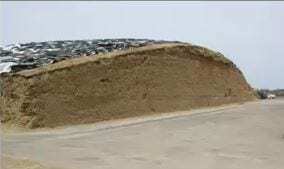 You will need to maintain the silage cover during storage and feeding. Generally, used tires are laid over the silage cover to prevent damage from wind and to further reduce the amount of oxygen exposure on the surface of the mass. Repairing damage to the cover from equipment, weather, and/or rodents is necessary to reduce oxygen intrusion into the silage mass. Planning the size of your silage mass will aid in determining if you will be able to feed at least 6 inches off the face each day. If you plan to daily feed 20 pounds per animal and you are feeding 200 animals, then you will feed 4,000 pounds each day. If packed correctly and harvested at the correct dry matter, the face should contain about 45 pounds/ft3 on an as fed basis. Thus, one would need to feed about 89 ft3 each day. If the silage mass was 8-ft high and you are feeding daily 6 inches from the face, the maximum width of the silo would be 21.5 ft. Widths or heights greater than this would result in greater face exposure over time, resulting in increased losses of dry matter and nutrients. One needs to keep in mind that heating of the silage mass, either during initial fermentation or due to secondary fermentation, results in the loss of the most-digestible energy of the crop. Once converted to heat energy by the yeast and mold, it is no longer available to the animals. Research at KSU has shown that feeding spoiled silage can significantly reduce the intake of growing animals, resulting in reduced performance. This results in a double-edged sword: reducing the intake and reducing the available nutrients in each mouthful for the animals. What does poor silage management cost? Just the loss of dry matter alone can range from 10 to 40%. If silage packed in the silo is worth $50/ton as feed, then the potential loss on an as-fed basis could range from $5 to $20 per ton. This results in a real cost of silage of $55 to $70 per ton as the feed goes into the ration. If the silage fed is spoiled and it reduces the animal performance, then an operation suffers additional losses associated with lost animal performance. When determining if silage is an economical feed in your operation, be sure that you consider the impact of shrink and how you can reduce the shrink. Harvesting at the correct moisture is simply timing and planning. Plan to get it done correctly. The use of silage inoculants can aid in silage fermentation, reducing losses and improving the quality of the finished product. This can lead to increases in animal performance, which reduces the cost of gain. Thus, when considering the economic benefits, make sure you consider how each ton of silage may impact animal growth and performance. Using a silage inoculant, applying an oxygen barrier, and using a plastic silo cover will decrease the cost of your silage by $7 to $10 per ton. The potential return due to decreased loss and increased production is often from $20 to $40 per ton. This represents a good return on investment and an opportunity to increase farm profitability.